Posted by Eddie & filed under Mountains & hills, Travel, June 16 2007. This morning I returned from a 2-week trip to the Canadian Rockies with Lesley. We flew from Glasgow to Calgary, Alberta with Zoom Airlines (whom I can recommend for the long 8-hour transatlantic crossing to western Canada, despite them being a charter airline). We stayed in Jasper National Park for the majority of the time we were in the Rockies. I first went there in 1998, and have always wanted to return for a longer stay. We spent one night at the Columbia Icefield Chalet, which is definitely one of the most unusual places in the world to stay; it is on the Icefields Parkway (itself one of the most incredible roads in the world) at an altitude of 2000m, and we had a sensational view of the Athabasca Glacier, Mount Athabasca and the edge of the enormous Columbia Icefield from our room window (this is not the highest hotel I’ve stayed in though – in Jan 2005 I stayed at the Parador Hotel Canadas del Teide on Tenerife, at an altitude of about 2200m). Here’s a photo of the view from our room. Whilst staying at the Icefield Chalet we went for a trip on one of the snow coaches that take you right out onto the surface of the Athabasca glacier at an altitude of about 2180m, and you don’t have to expend any energy to get there. This is a unique experience – possibly the only place in the world you can be in a true glacier environment without being a mountaineer (the only time I’ve experienced anything similar was on the Glacière de Ferpècle in Switzerland last year, and there I was part of a guided group that was roped up and had ice-axes and crampons). 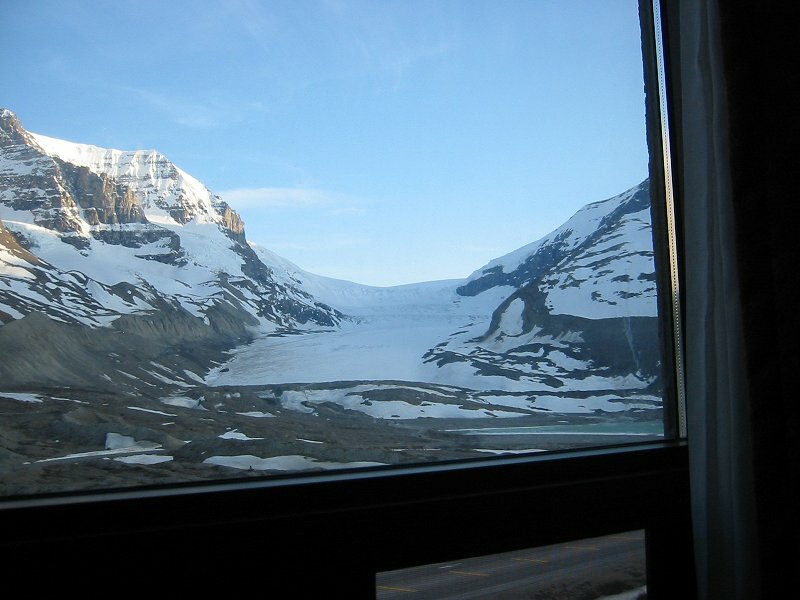 Weather conditions on the Athabasca Glacier were perfect with clear blue skies, and we had jaw-dropping views of the surrounding mountains, particularly Mount Andromeda and the hanging glaciers on its northern flank. 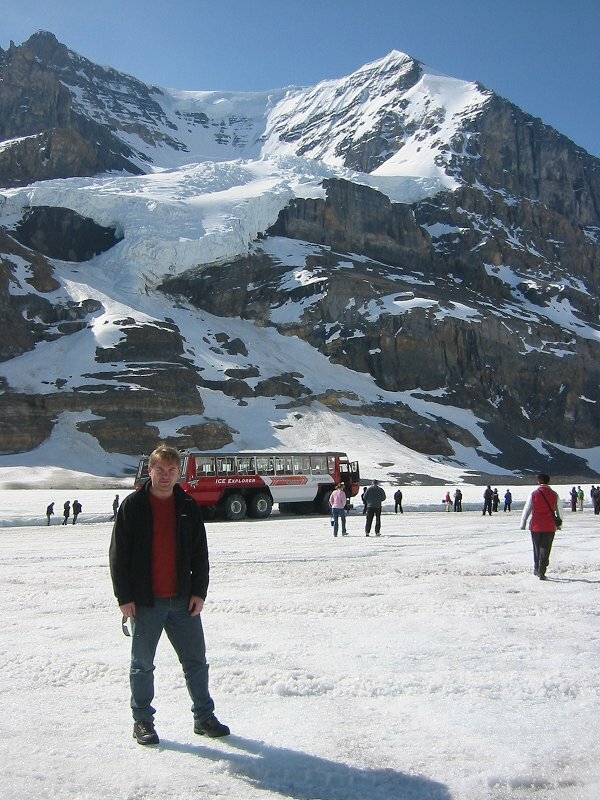 Here’s a photo of me on the glacier. You can also see a Google Maps display of the glacier visit here. 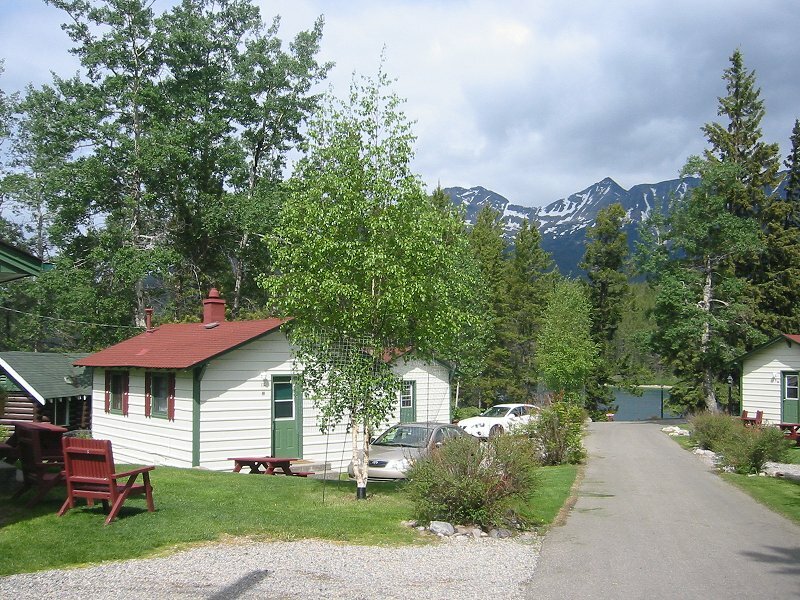 We also stayed for a week at the Patricia Lake Bungalows (photo here). This is near the town of Jasper, on Patricia lake (which featured in an unusual episode from World War 2). We had a lodge to ourselves right on the lake, which sits on the ‘Pyramid Bench’ beneath Pyramid Mountain, and is surrounded by thick woods. The mountain summits of Jasper National Park surround the lake, making it an idyllic spot. June is not yet summer in the Canadian Rockies, and it was still out of season for most tourists and so very peaceful. We spent the time at the lodge hiking through the woods, swimming in the lake, soaking in the outdoor hot tub, eating alfresco (Pyramid Lake Island being a great spot) or just chilling out and enjoying the views. The town of Jasper itself is fairly small but full of good places to eat and drink. There has been a large amount of snowfall in the Rockies this winter (the last snowfalls are actually not quite finished at higher elevations even now); this meant stunning scenery but also restrictions on what we could do as some hiking trails and even roads were still closed due to snow. We couldn’t do the Parker Ridge Trail hike and the Mount Edith Cavell road was still shut when we were there. 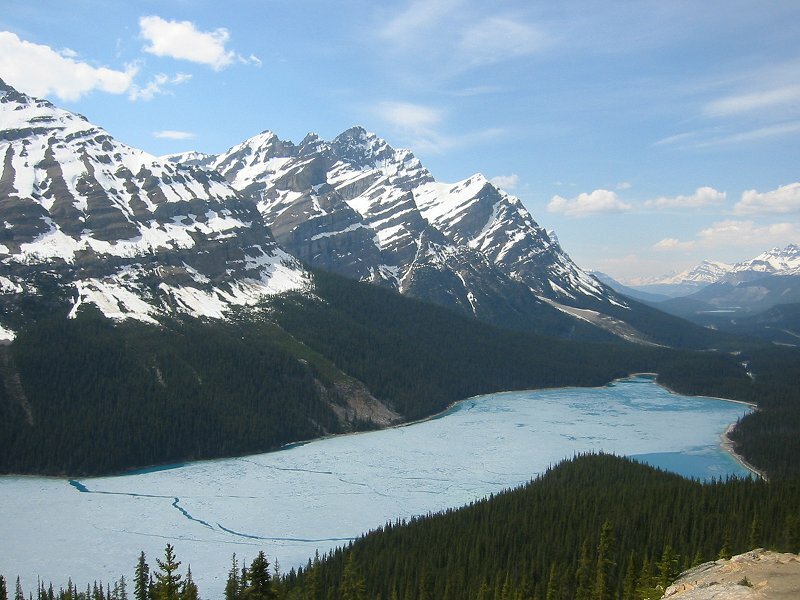 During the drive to Jasper along the Icefields Parkway we did manage the (relatively) short hike to the Peyto Lake viewpoint; usually this is an easy 15-minute walk along a road and a trail but for us it was a difficult slog through thick snow. The view of the still-frozen lake was worth it though. Here’s a photo I took showing the classic view. 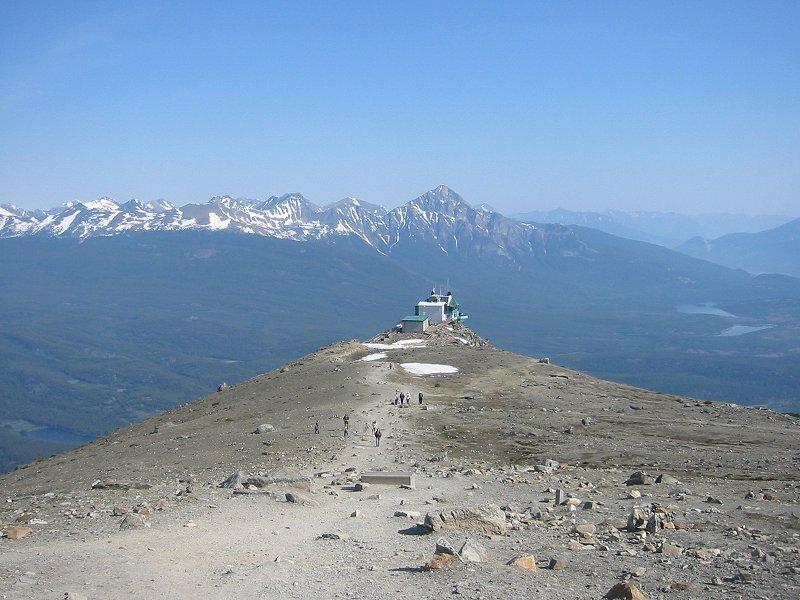 We managed to get to do some walking on The Whistlers near Jasper (using the tramway to get most of the way up, photo here) but even here snow conditions stopped us getting to the actual summit itself (although we were close enough for most people’s purposes). During our stay at Jasper we also visited Maligne Lake and Canyon. The 512 Mb memory card in my Canon digital camera is almost full with pictures from the trip and I’ll be uploading the best of them to my website over the next few days here. I’ll also be posting a few more blog entries here with some more details of the trip. Lesley’s blog entries about our trip can be seen here: part 1, part 2, part 3, part 4, part 5, part 6. I can’t recommend Zoom Airlines anymore!